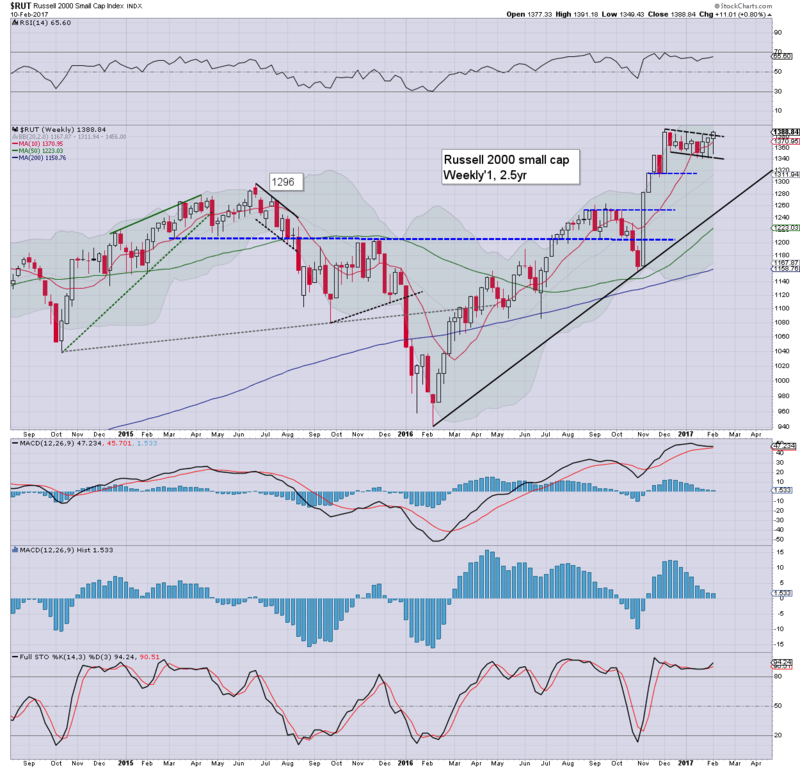 The US equity market continues to broadly climb, regularly breaking new historic highs. 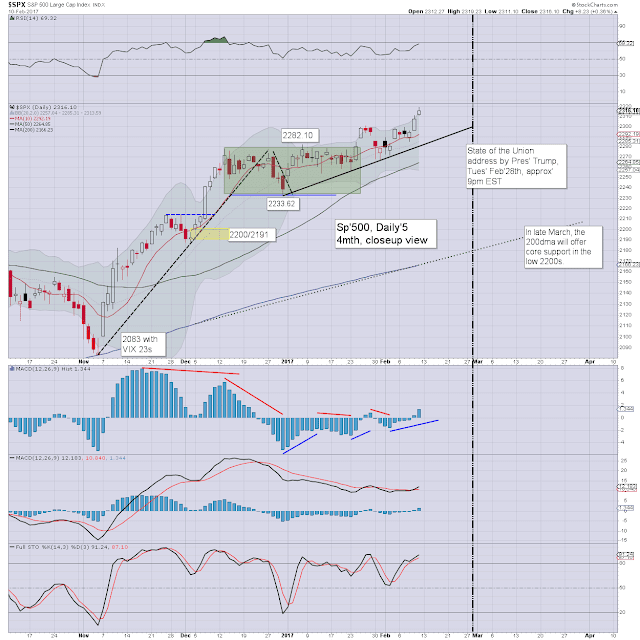 Near term outlook offers a 5% retrace, but that will do nothing to dent the primary bullish trend. 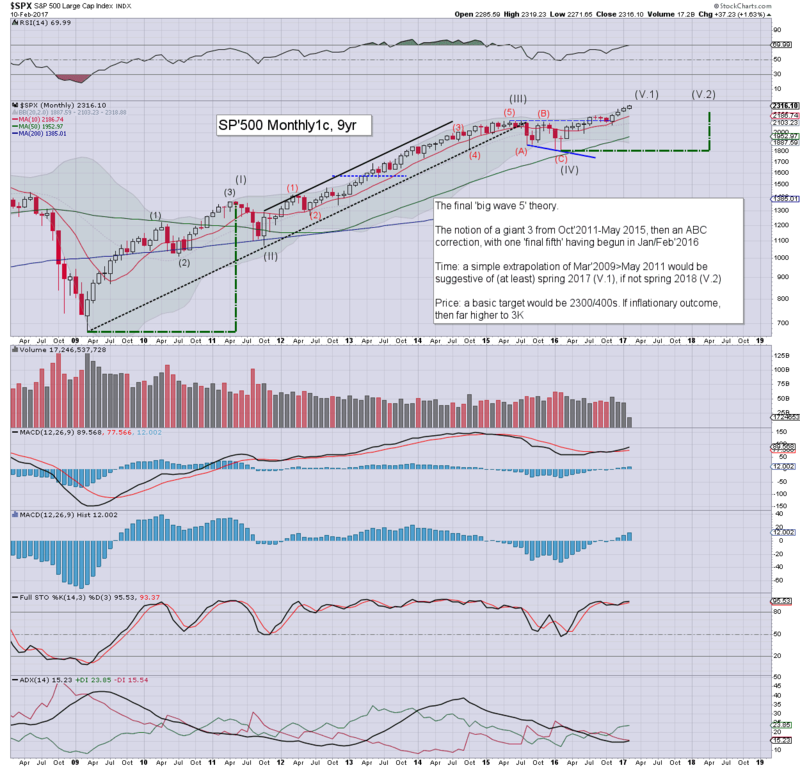 As things are, the market looks set for broad upside across the year, with the sp'2500/600s a realistic year end target. Currently, the sp' is net higher for a fourth consecutive month, with a new historic high just this past Friday of 2319. It is notable this is just 1pt above the upper bollinger. Underlying MACD (blue bar histogram) cycle continues to tick higher, and is now on the moderately high side. 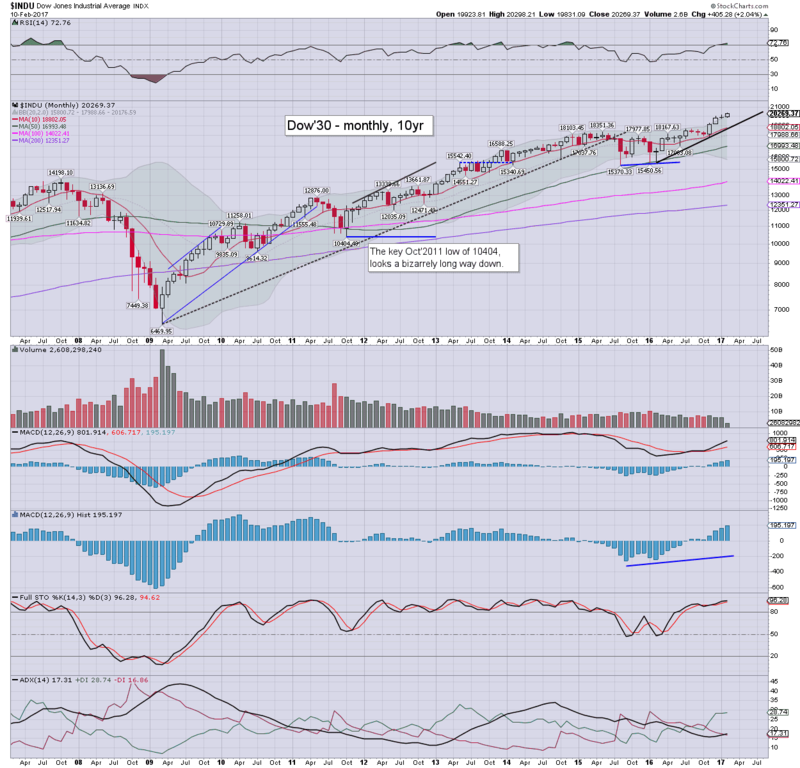 Note the 10MA @ 2186, and that will jump to the low 2200s at the March 1st' open. The tech sector continues to lead the way higher, with a new historic high of 5743. The 6000s look viable by June/July, even if the main market retraces by around 5% across March/April. Core support is the giant psy' level of 5K, with the key 10MA already somewhat above that in the 5200s. 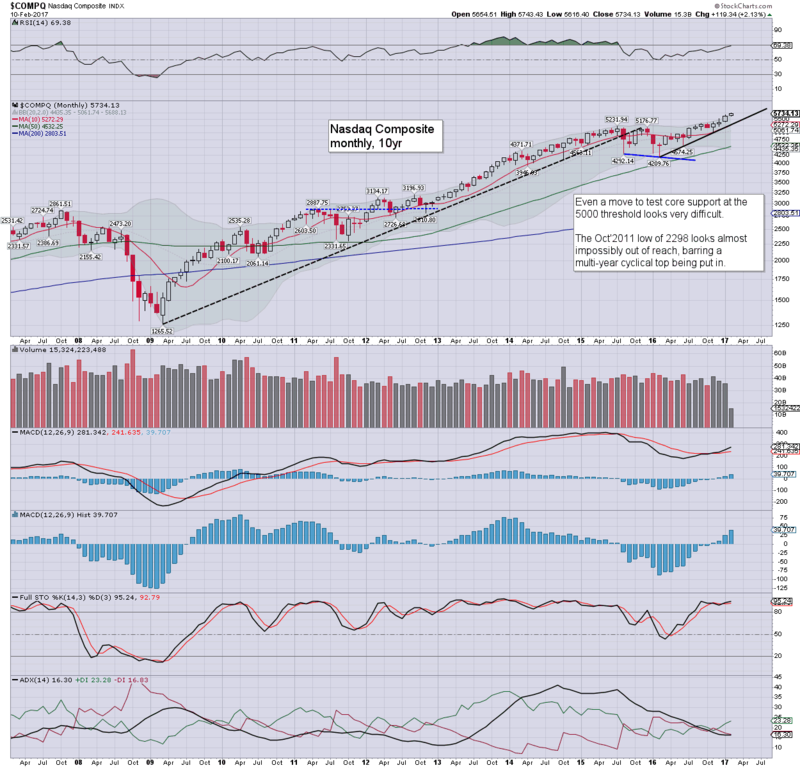 It is notable that the Nasdaq comp' is currently 353% higher from the March 2009 low of 1265. The mighty Dow is currently net higher for a fourth consecutive month, having broken a new historic high of 20298. The key 10MA will soon be in the 19000s, and on balance, no price action <19k can be expected for the rest of the year. 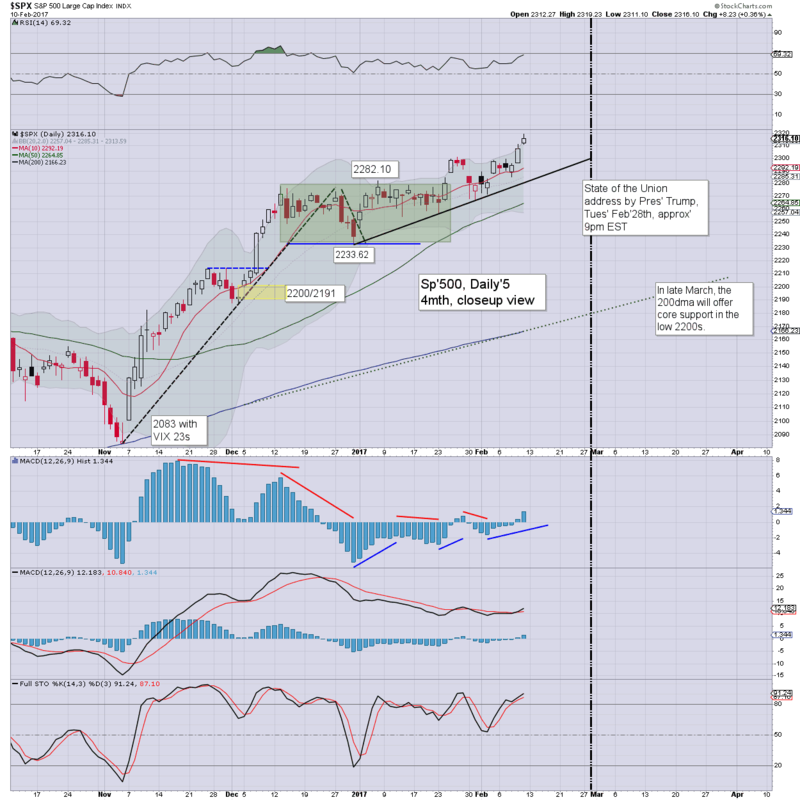 By July, key rising trend will be around the giant psy' level of 20k. A year end close within the 23-24k zone is a very viable target. 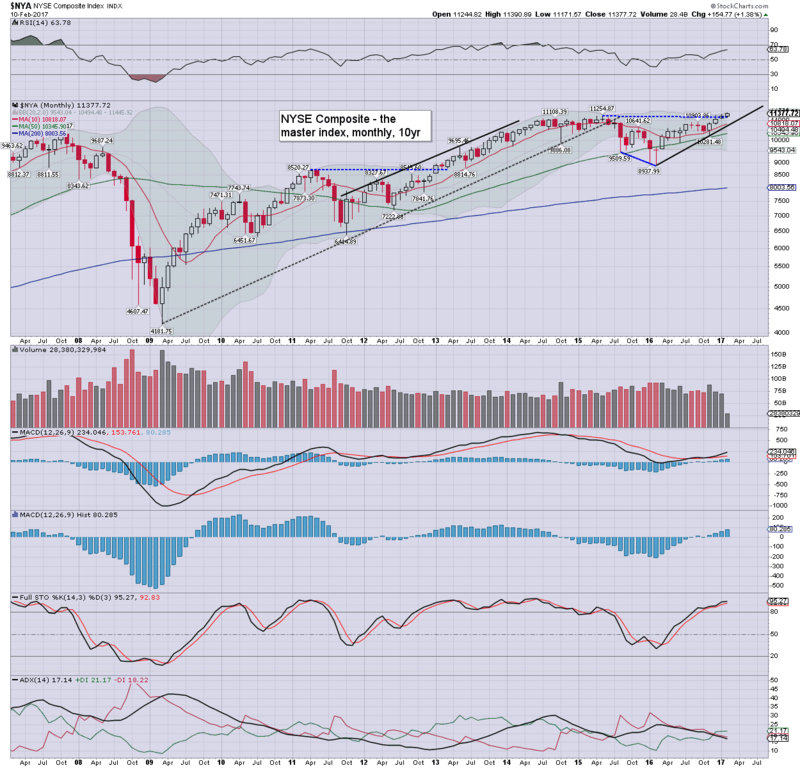 The NYSE composite continues to climb, with a new historic high of 11390. The election low of 10281 is now a clear 10% to the downside. The key 10MA will soon be in the 11000s, and will act as first soft support across the spring. The 12000s look a viable target this summer, with the 13000s by year end. The second market leader - R2K, has been in an exceptionally tight trading range since early Dec'2016, but is now just 4pts shy of the Dec' high of 1392. Near term offers upside to the 1425/50 zone, before a probable retrace of around 5%. First soft support will be the 1300 threshold, where the 10MA will soon be. 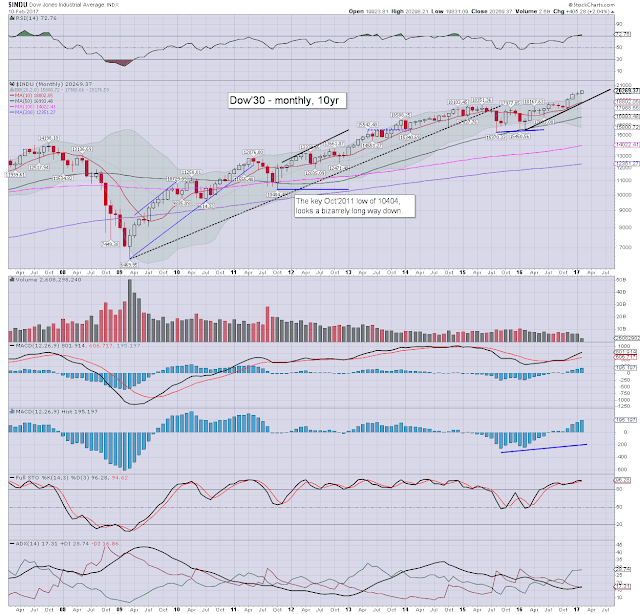 R2K to the 1500s looks probable this summer. 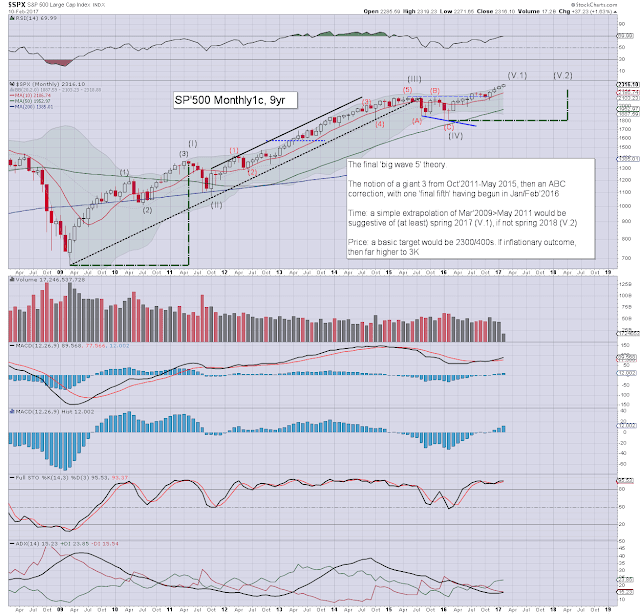 A year end close in the 1700s is a valid target. It remains curious how virtually no one is discussing 'R2K @ 2K'. The 'old leader' - Transports, is currently net higher for a fourth consecutive month, the best run since Nov'2014. January saw a new historic high of 9502, and that looks set to be broken above (if marginally) by early March. A 5% retrace should see price action no lower than 8700/500. Things only turn provisionally bearish with a break under the Nov'2016 low of 7958. All US equity indexes continue to push upward, lead higher by the Nasdaq, with the Dow and SP' following. 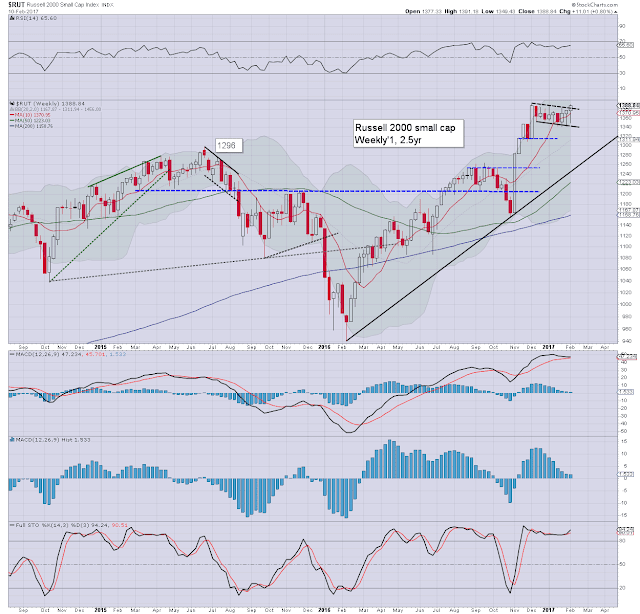 Broadly, the US market looks due a further 5/10% higher by May/June to the sp'2400s, even assuming a 5% retrace sometime within March/April. 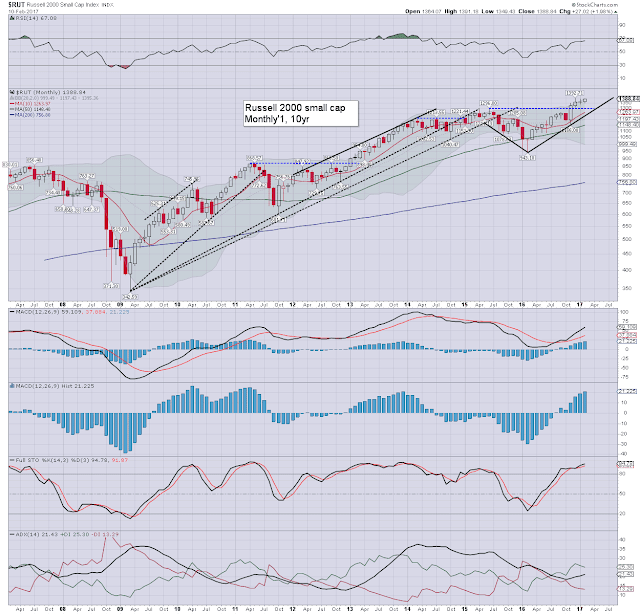 Equity bears have nothing to tout unless a monthly close under the key 10MA, which in March, will be in the low 2200s. Five wave theory still valid? 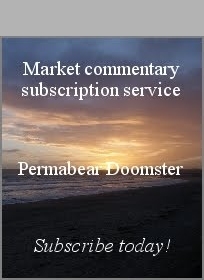 Price structure for the sp'500 is still supportive of the notion that the market is currently in a final fifth wave. Last year I regularly noted that spring 2017 would be a basic 'time target', and we're almost there. Keep in mind other world equity markets - especially the German DAX, which has the most well defined '5 waves' price structure that I'm aware of. I remain of the view that for now, there is zero reason to be bearish. Higher rates will help the financials, and if 'Mr inflation' does start to appear, equities will continue to broadly climb. Further, if the bond market has seen a multi-decade top, then further capital flows into equities can be expected, prolonging the current rally that will soon be eight years old. 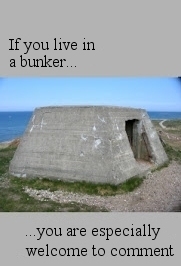 *There are a fair few fed officials on the loose. Notably - Yellen, who will be addressing the US Senate and House respectively on Tuesday and Wednesday. **As the US market is CLOSED the following Monday, Feb'20th, Friday will likely be rather subdued, with micro chop into the opex close. I continue to post intraday. Subscribe! Back on Monday... at 7pm.... probably. US equity indexes closed moderately higher, sp +8pts at 2316. The two leaders - Trans/R2K, both settled higher by 0.7%. VIX settled -0.3% @ 10.85. 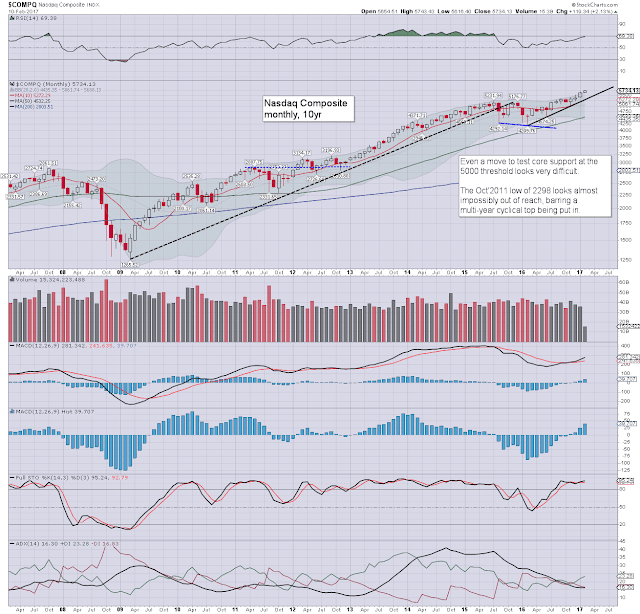 Near term outlook threatens a retrace to 2296/94, before resuming upward to the 2320/30s. The 2340/50s appear viable by first week of March. 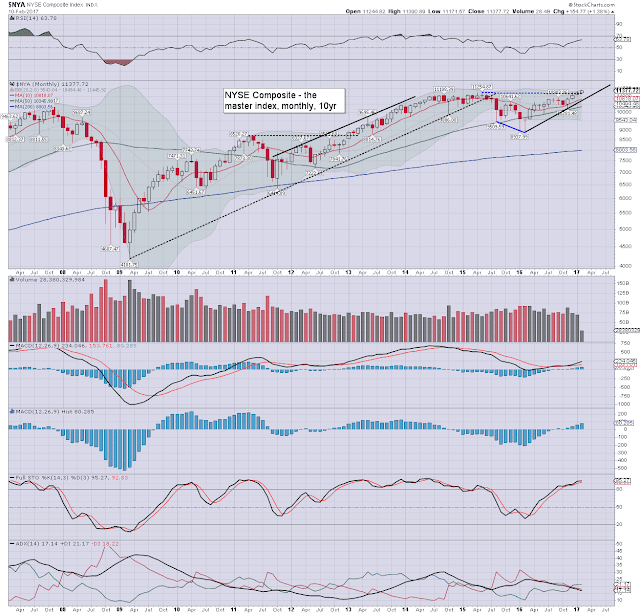 Suffice to add, it was another day, and week for the equity bulls, with a quartet of new historic highs in the sp', dow, nyse comp', and nasdaq comp'. 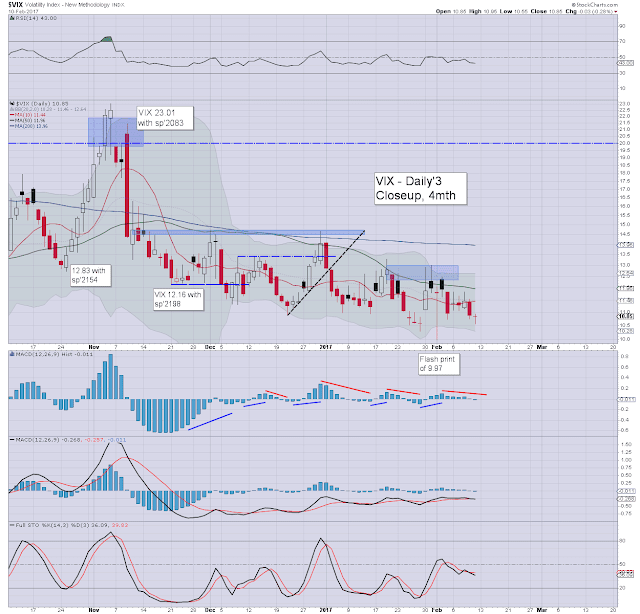 VIX remains naturally subdued, having melted lower into the weekend. The key 20 threshold looks out of range until at least the latter half of March. 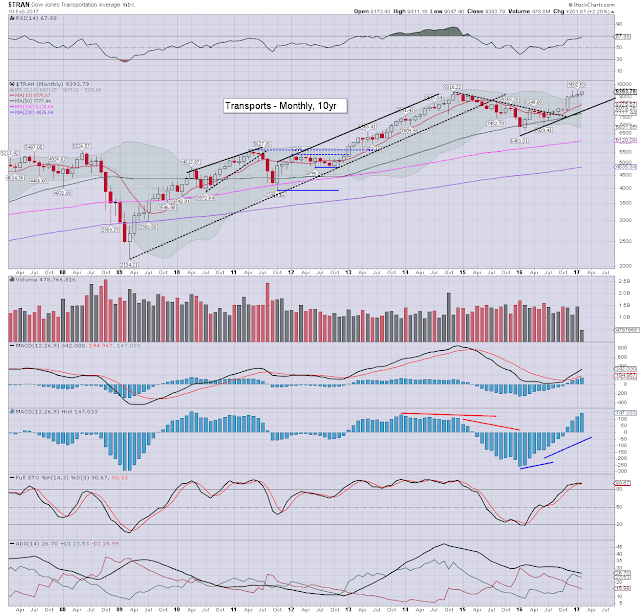 Seen on the bigger weekly cycle, there is clear bull flag, and the R2K is provisionally confirming it. Further upside to 1425/50 seems a given within 2-3 weeks. 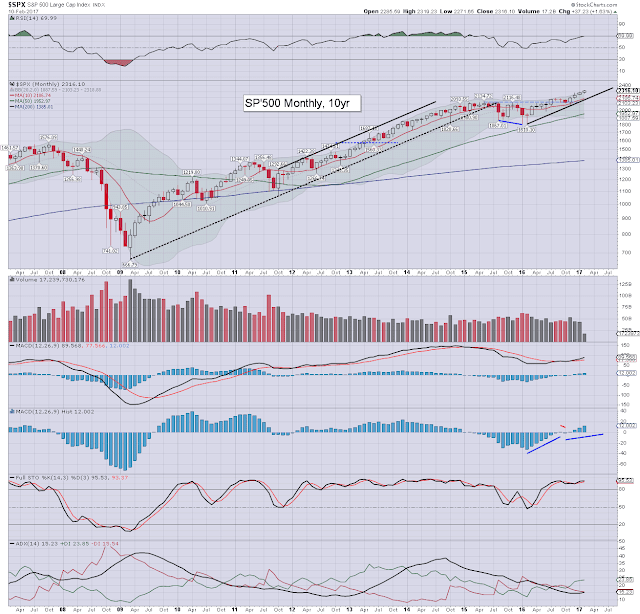 That arguably equates to sp'2340/50 in the first week of March.